Measuring only 2.6” tall and at an affordable price, the RSB-3 is designed to fit below your TV and quickly connect regardless of wall mounting or table top use. Earn 325 loyalty points when you order this item. Klipsch RSB-3 all-in-one audio solution is designed to quickly connect to your TV within minutes of unboxing to seamlessly transform your television into an incredible home theater system - all for an obtainable price. 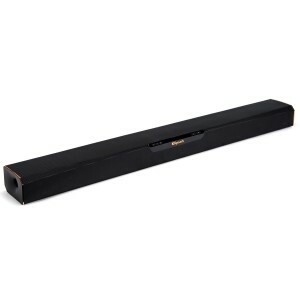 Klipsch Reference RSB-3 sound bar is designed to quickly connect to your TV. Measuring only 2.6” inches tall, the RSB-3 is designed to fit below your TV regardless of wall mounting or table top use. Simply plug in the included optical cable to seriously upgrade your TV sound with no hassle. The built-in Dolby Audio Decoder formats all your Dolby content to provide a detailed, powerful cinema experience. Dual 3/4” horn loaded soft dome tweeters with 90° x 90° Tractrix horns deliver crisp highs while dual 2.5” oval woofers round out the enhanced sound for clear vocals and dynamic soundtracks. DSP controlled crossover via separate amplifier channels drive tweeter and woofer. Powerful 2.5” oval woofers reproduce impressive bass for their size so you can experience the rumble in a small form factor. RSB-3 works great with all Bluetooth-enabled smartphones, tablets and computers allowing you to play music direct from your device. Klipsch enhanced virtual surround gives you an engulfing surround sound effect without all the additional speakers and wires. Voice Enhance mode increases dialogue volume for enhanced vocal clarity without increasing ambient sounds. An easy-to-use wireless remote control included. Rubber feet & keyhole mounts allows you to place the sound bar on a tabletop or mount it to the wall.